Description: A westbound Z train flies around the curve at the east end of CA Jct. Title: BNSF C44-9W #1053 leads an eastbound at Mesa Rd. Description: S-SEACHC at GRAF with a MRL SD45-2 along for help. Description: A goat boat wears the colors of the railroad that built the tunnel it is now going through. Description: The daily short Z-train heads West towards Montana. Description: BNSF 1053 leads another Dash 9 and an ES44AC on a freight through Old Monroe, Mo. 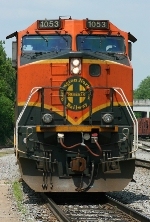 Description: NS 22A at the Bristol yard office with a BNSF H1 leader. 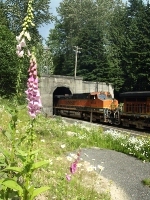 Title: BNSF 1053 leads a eastbound stacker.